14: Who Goes Camping with a Samsonite? 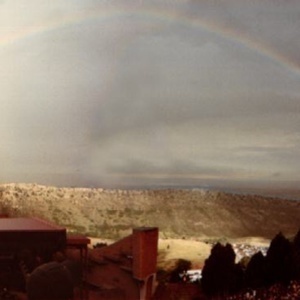 In case you missed it last week, we decided that if FDR had decided “swamp draining” was a better idea than, say, rebuilding and improving an entire country, we probably wouldn’t have Red Rocks Amphitheatre. It’s an absolutely stunning place, and its clear that the boys turn it up to 11 each year they head up the mountain to Morrison. This week, we get to hear all about that time Jeff went camping with hard shell Samsonite suitcase, which is just the kind of added value you get here at the Bluest Tape. This week, we bring you the best of 1999-2002, including some classic collaborations with the Dirty Dozen Brass Band, a ripping Thought Sausage from 2000, and some memorable moments from 2001 and 2002.